Established in 2006, Driven AM is a Drum and Bass Record Label, Artist Manager and Live Event Coordinator based in NYC. Join us monthly at Sunnyvale for amazing music in an inclusive environment with positive vibes. About DRIVEN AM: Established in 2006, Driven AM is a Drum and Bass Record Label, Artist Manager and Live Event Coordinator based in NYC. Join us monthly at Sunnyvale for amazing music in an inclusive environment with positive vibes. About Driven AM: Established in 2006, Driven AM is a Drum and Bass Record Label, Artist Manager and Live Event Coordinator based in NYC. Join us monthly at Sunnyvale for amazing music in an inclusive environment with positive vibes! About Driven AM: Established in 2006, Driven AM is a Drum and Bass record label, artist manager and live event coordinator based in NYC. Join us on the 2nd Saturday of every month at Sunnyvale for amazing music in an inclusive environment with positive vibes. Driven AM brings in the New Year with a Drum and Bass legend!!!!! With a career spanning over 25 years, from a Mercury Music Prize recipient to earning a Mobo Award, DJ SUV’s career and contribution to Jungle/Drum & Bass culture speaks for itself. A crucial member of the respected “Reprazent” & “Full Cycle” Groups. Early in his career DJ SUV was a founding member of the seminal 1989 group “Fresh Four” – who burst onto the scene with the foundation track ‘Wishing On A Star’ which peaked at #10 on the UK Singles Chart & #22 on the Irish Singles Chart. A founding member of the Mercury Music Prize winning group - “Reprazent” aka “Roni Size Reprazent” their debut album “New Forms” won the Mercury Prize in 1997 and went five times platinum. Their follow-up album In the Møde featured artists including Rahzel, Zack de la Rocha of Rage Against the Machine and Method Man. Reprazent's music has been described as containing “meticulously crafted break-beats that, when slowed down, revealed themselves as hip-hop beats”. The most popular track, “Brown Paper Bag”, was praised in the Guardian as a “masterpiece: an essay in hyperkinetic pace, it piles up teetering stacks of instrumental layers, their cumulative weight triggering each step in a constant cycle of demolition and reconstruction of its latticework of melody, rhythm and mood". The singles from New Forms featured the vocals of Onallee, whose call for the music in "Brown Paper Bag" is a signal that became widespread in rave culture. DJ SUV has undoubtedly contributed his fair share to the development of the British underground music culture and definitely to the sound of Bristol cementing his name in music history books as one of the forward-thinking pioneers. His work within different time signatures, particularly evident within the Free Beat EP for Full Cycle, brought an abstract feel to his sound that was not deliberately awkward, but more a reaction against a perceived militancy in drum'n'bass production. Fast forward to 2018 and DJ SUV is traveling the globe playing festivals & club nights while releasing music on a variety of labels including powerhouses like V Recordings, & Natty Dub, as well as his own Playside Records & Playside 175 based in the USA which he co-runs. About DRIVEN AM: Established in 2006, Driven AM is a Drum and Bass record label, artist manager and live event coordinator based in NYC. Join us every month at Sunnyvale for amazing music in an inclusive environment with positive vibes. Hospital Records legend LOGISTICS returns to NY to help us celebrate 1 year of DnB events at Sunnyale!!!! About DRIVEN AM: Established in 2006, Driven AM is a Drum and Bass record label, artist manager and live event coordinator based in NYC. Join us every month at Sunnyvale for amazing music and positive vibes. About SUNNYVALE: Sunnyvale is a big empty room. Within this empty room resides the endless possibilities of creative expression. Artists from around the world can congregate in this neutral environment to tell their own stories and continue the narrative that is New York City culture. As a home for free expression, it is crucial Sunnyvale maintains its position as a safe space, which means freedom from harassment of any type, so that one can feel genuinely free to express themselves. Our business priorities are standardized to benefit all stakeholders including patrons, neighbors, employees, and artists. About DRIVEN AM: Established in 2006, Driven AM is a drum and bass record label, artist manager and live event coordinator based in NYC. Join us every month at Sunnyvale. Driven AM and friends present: NYC DNB! This event is FREE, however there MAY be a $10 parking fee for anyone who is not a Nassau County Resident or does not have a Nassau County Leisure Pass, this is per car not per person. Please bring food for the grill, water, good vibes, and if you are of age you can bring alcohol but NO glass bottles. We ask that you help us to leave the park in the same condition as it was when we arrived, as we all have for the last 13 years. The park is located on the south shore of Long Island, about 45 minutes from NYC. Driving to the park is easy, it is a few minutes away from the Wantagh Parkway, Route 135, and the Meadowbrook parkway. +Take I-495 Long Island Expressway to Exit 38 to merge onto Northern Parkway East toward Hauppauge, Take Exit 33 for Wantagh Parkway toward Jones Beach, Merge onto Wantagh Parkway South, Take Exit W6 East for Merrick Road East toward Seaford, Continue down Merrick Road for approximately half-mile, look for the park entrance on your right. Park in lot #6. +or take I-495 Long Island Expressway to Exit 44 for RT-135 toward Syosset/Seaford, Keep left at the fork, follow signs for RT-135 S/Seaford and merge onto RT-135 S/Seaford-Oyster Bay Expressway, go 9.8 miles, Take Exit 1W for Merrick Road West toward Freeport, Merge onto Merrick Road, Continue down Merrick Road for approximately half-mile, look for the park entrance on your right. Park in lot #6. +Or take The Southern Pkwy to Exit 28A S to merge onto RT-135 S/Seaford-Oyster Bay Expressway toward Seaford and follow the directions above. Jakes has many strings to his bow. From being front man to many live acts e.g T.C, Pendulum and Ez Rollerz to being the head of his own genre straddling label Hench Recordings, he has made a lasting mark on the world wide underground bass scene. Within a few years Jakes evolved and furthered his musical reputation from being one of the big name MC’s of drum and bass world to now being one of the pioneer’s of dubstep. The progression towards his now trademark style has been applauded by many - and not limited to his chosen passion. Standing on this solid foundation he has gone on to write music for films and voxed adverts for directors such as Darren Aronofski and brands such as PUMA. With a globally renowned stature for genre straddling music and inimitable style and having garnered support from legends across the board the U.K vocalist turned dubstep pacemaker boasts an extensive repertoire that has only expanded and metamorphosed with time. Now with new venture A.N.W.P. (AT NIGHT WE PLAY) Jakes will continue to push his musical repertoire further. About DRIVEN AM: Established in 2006, Driven AM is a Drum and Bass record label, artist manager and bass music live event coordinator, based in NYC. Join us every month at Sunnyvale. Driven AM and friends present another night of Jungle & Drum and Bass classics! 18+, $10 in advance, $12 at the door. Driven AM is a drum and bass record label, artist manager and live event coordinator based in NYC. 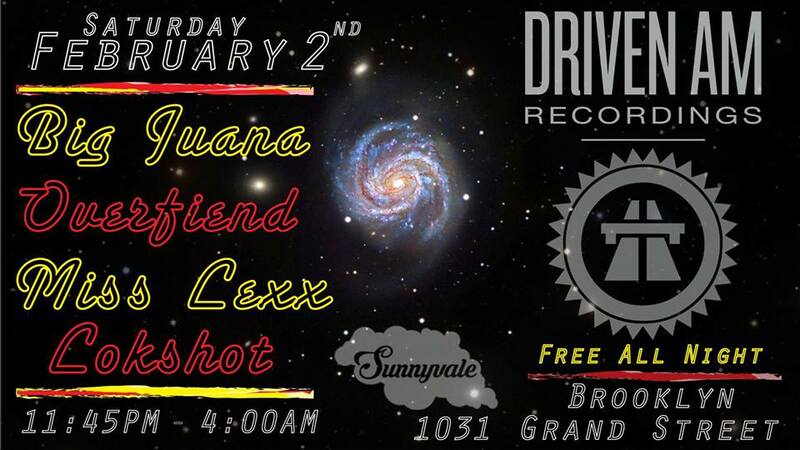 Join us every 2nd Saturday of the month for Drum and Bass at Sunnyvale. The music starts around 11:45PM however the venue is open all night, arrive early if you would like, and kindly let them know at the door you are there for Driven AM / DnB. Music ends at 4:00AM. Driven AM is a drum and bass record label, artist management and live event coordinator based in NYC. Driven AM & friends present another night of DnB! Heavy bass, room to dance and most importantly great vibes. There is also an excellent bar(tender). Join us for our last show of the year, as we celebrate a fantastic year of drum and bass music. Driven AM & friends present another night of NYC DnB! Join Driven AM & friends as we celebrate the release of ‘Driven Family Vol. 3’!